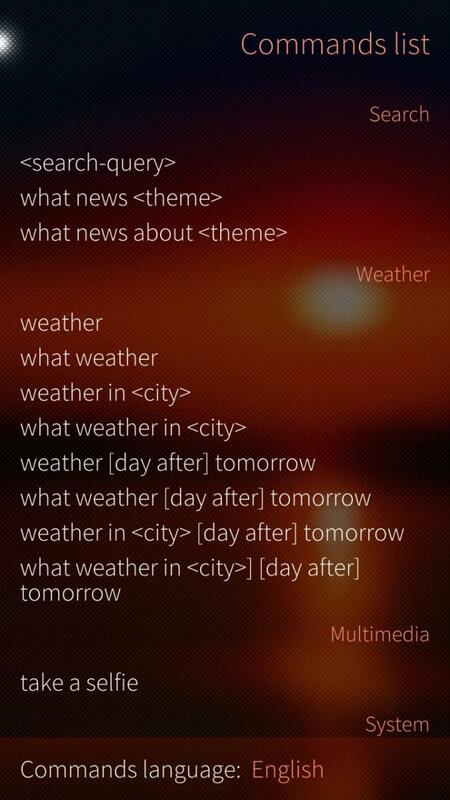 The voice assistant for Sailfish OS. Are there any plans to update this app or has support for it finished? I also noticed same problem as Abreen have with Xperia x single sim model and also same Sailfish os version. Hopefully you guys update this grrat application. Anyways this application needs updates and improves. Furthermore, here at home, I tried to let Serra perform tasks like "Call Paul". At this point, it seems to be treated as a search command on Google. Should I teach Serra what to so (how?) or should I create a User command (and what would be the syntax for that?) I'm running v0.5.0. Too many questions, undoubtedly. Thanks in advance for answering! Unfortunately now you have to touch the microphone icon. For calling you should use full name from your address book. Unable to start the apps. Thanks. When SFOS 2.1 will be public available I can fix it. SFOS 2.1.0.11, not able to start app properly, process exist (and does something basing on CPU consumption) but no UI has started. Hey one more idea: i know this one will be tricky, but attenuate speaker volume when music is playing AND recording button is pushed OR recording is happening OR when SERRA is providing Audio feedback. That way music streaming/playing through speaker will continue uninterrupted but wont interefere with voice commamds or SERRA. Bug: with talk as long as microphone is pushed action doesnt work well from cover when saying: turn on bluetooth, it will open app anyways, maybe highlighting simple.commands would help, or when in cover mode and upon first press record until you push the search button.from the cover view. So push short - record, keep recording, until another short push on microphone from cover. This should be based on monitoring recording engine and verifying that button as been pushed, is no longer pushed (with push and record enabled, and voice is starting to be processed. 3.Turn-off voice response from Serra on successful voice command, as soon as record button is pushed again, that way when you do directions you can quickly record and say Start, and dont have to wait for Serra saying out loud the command. 1-2. Thanks. I'll add this. Great app!! Thanks for developing it!!! I know that your app is only supported for Russian and English languages, but are there any possibility to support others languages? Maybe later. Now the prime task is adding new commands. Search works, very nice! On Intex Aquafish when i say Turn on flashlight it wont turn on. But when i say Turn on Torch it works. Recommendation: Select default device language automatically, then provide message to user on screen if currently not supported, only english and russian is. 2. I noticed when saying turn on torch quickly it works, but when stretching it out to Turn ....... On...... Torch... it only recognizes the last noun torch, even though it should start amd kepp recording as long as button is pushed. Acn you verify recordings of 10sec - to 20sec work if you dont immediatelly start talking? 1. Okay, I'll add this. 2. Unfortunately this is a problem with speech recognition service. I changed records encoding. Maybe it'll help. A very nice start. 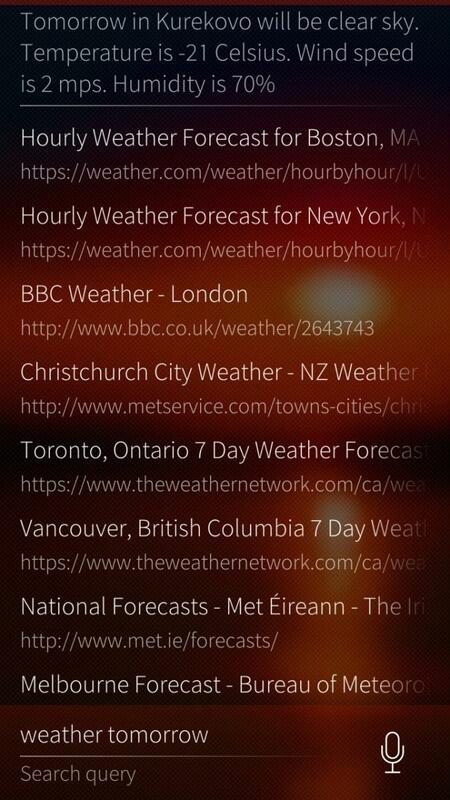 Weather command actually works and the search in general but I couldn't get the other commands to work. They just made a search query and not what they were suppose to do. I hope you continue developing this. Other commands do not have voice answer yet and it is possible to think that they do not work. I will add this feature lately. Please, check twice. Maybe you did not notice that command was done. P.S. Search is made every time when you say something.